By Admin in Resources on August 17, 2018 . Convenient, light-weight, portable, durable, and eco-friendly, this dry erase bundle includes 12 pockets and 12 markers. Use your worksheets again and again and save paper. 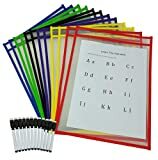 Slide the worksheets into the pockets and have your students write directly on the vinyl surface with the included dry erase markers. The pockets come in 6 bright fun colors (red, yellow, purple, green, blue, and black). Vinyl pocket material wipes down quickly and easily with any dry board eraser, cloth, or tissue. Pockets also come with a convenient metal grommet at top center for easy hanging and storage. Seams are professional grade for tough jobs with a soft felt cloth edge. Dry erase markers are non-toxic, low-odor and all black. Marker caps feature convenient magnet and eraser for easy storage and quick fixes.